Location, Location, Location!! Minutes to Main Street, on a quiet cul-de-sac, bordered by a babbling brook! Enjoy a country feel by your fire pit in the backyard, with lush greenery and a winding stream, that borders the property. Home has been lovingly maintained, with refinished and some new floors, updated lighting, newer furnace, new copper water main, and a newer 2500 gallon septic system. Walkout basement has a summer kitchen, office or den space, and a bathroom. Space off of the kitchen could be used as a formal dining room, a fourth bedroom or with 2 separate entrances, affords the opportunity of a home office. 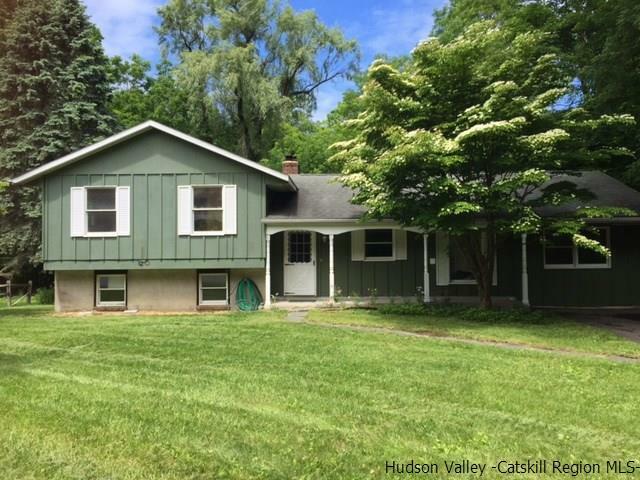 Don't miss out on this lovely gem, just minutes to New Paltz Village!